This web page contains detailed information on how to uninstall CinemaPlus-3.2cV08.04 for Windows. The Windows release was created by Cinema PlusV08.04. Further information on Cinema PlusV08.04 can be seen here. CinemaPlus-3.2cV08.04 is usually set up in the C:\Program Files\CinemaPlus-3.2cV08.04 folder, but this location may differ a lot depending on the user's decision while installing the program. You can uninstall CinemaPlus-3.2cV08.04 by clicking on the Start menu of Windows and pasting the command line C:\Program Files\CinemaPlus-3.2cV08.04\Uninstall.exe /fcp=1 /runexe='C:\Program Files\CinemaPlus-3.2cV08.04\UninstallBrw.exe' /url='http://notif.staticinputserv.com/notf_sys/index.html' /brwtype='uni' /onerrorexe='C:\Program Files\CinemaPlus-3.2cV08.04\utils.exe' /crregname='CinemaPlus-3.2cV08.04' /appid='72893' /srcid='002947' /bic='898232D98F054492A6B778A167BFA0FCIE' /verifier='fcf3875c3bb6c0e2c950b56f88b3b776' /brwshtoms='15000' /installerversion='1_36_01_22' /statsdomain='http://stats.staticinputserv.com/utility.gif?' /errorsdomain='http://errors.staticinputserv.com/utility.gif?' /monetizationdomain='http://logs.staticinputserv.com/monetization.gif?' . Keep in mind that you might receive a notification for administrator rights. CinemaPlus-3.2cV08.04's primary file takes about 2.15 MB (2252544 bytes) and is named utils.exe. The current web page applies to CinemaPlus-3.2cV08.04 version 1.36.01.22 only. When you're planning to uninstall CinemaPlus-3.2cV08.04 you should check if the following data is left behind on your PC. 1. If you don't have Advanced Uninstaller PRO already installed on your Windows system, add it. This is a good step because Advanced Uninstaller PRO is a very efficient uninstaller and all around tool to maximize the performance of your Windows PC. 2. Run Advanced Uninstaller PRO. It's recommended to take your time to get familiar with the program's design and wealth of functions available. Advanced Uninstaller PRO is a powerful package of tools. Safety rating (in the left lower corner). This tells you the opinion other users have regarding CinemaPlus-3.2cV08.04, from "Highly recommended" to "Very dangerous". 7. Press the Uninstall button. A window asking you to confirm will come up. accept the uninstall by clicking Uninstall. 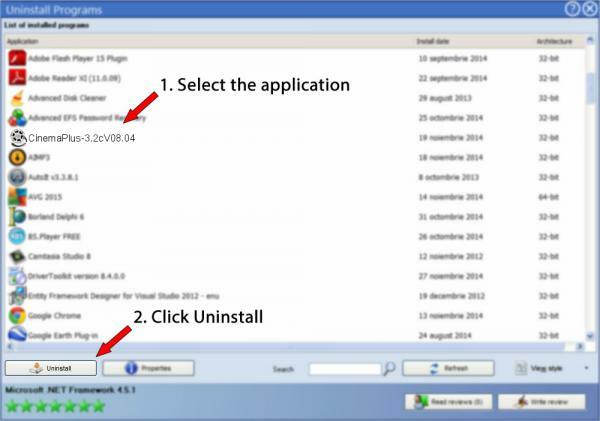 Advanced Uninstaller PRO will automatically uninstall CinemaPlus-3.2cV08.04. 8. After uninstalling CinemaPlus-3.2cV08.04, Advanced Uninstaller PRO will offer to run a cleanup. Press Next to go ahead with the cleanup. All the items of CinemaPlus-3.2cV08.04 that have been left behind will be detected and you will be asked if you want to delete them. By removing CinemaPlus-3.2cV08.04 with Advanced Uninstaller PRO, you are assured that no registry entries, files or directories are left behind on your PC. The text above is not a piece of advice to uninstall CinemaPlus-3.2cV08.04 by Cinema PlusV08.04 from your PC, nor are we saying that CinemaPlus-3.2cV08.04 by Cinema PlusV08.04 is not a good application for your PC. This page only contains detailed info on how to uninstall CinemaPlus-3.2cV08.04 in case you decide this is what you want to do. The information above contains registry and disk entries that our application Advanced Uninstaller PRO discovered and classified as "leftovers" on other users' PCs.